Okay you guys this cake is AMAZING! Perfect and tender texture and subtle flavors make it a huge hit! I couldn't help but smile and think of Spring as I was making it! Perfect cake for your Easter Sunday Brunch??? I think YES! I know it will be apart of ours! Enjoy! Preheat your oven to 325 degrees. Grease and flour a 10 inch bundt pan. Sift together 2 1/4 cups(reserving other 1/4 cup) of the flour, baking soda and salt. Mix in the lemon zest and set aside. With an electric or stand mixer, cream your butter and sugar until light and fluffy. Beat in the eggs one at a time. Add your vanilla and 1 tablespoon of the lemon juice and mix well. Alternate beating in the flour mixture with the yogurt a little at a time, beginning and ending with the flour mixture. 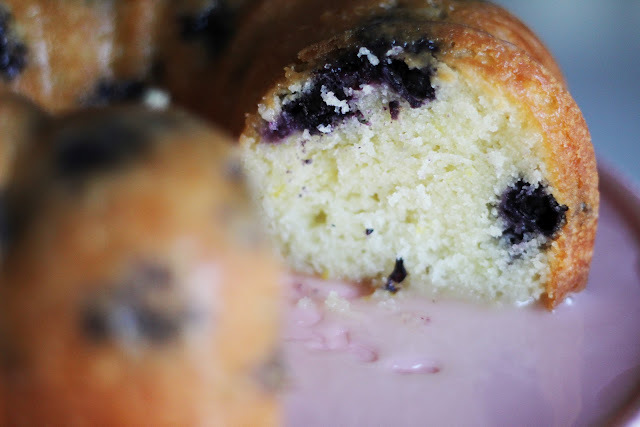 Toss your blueberries with the reserved 1/4 cup flour to prevent them from bleeding into the creamy batter. Gently mix them into the batter. 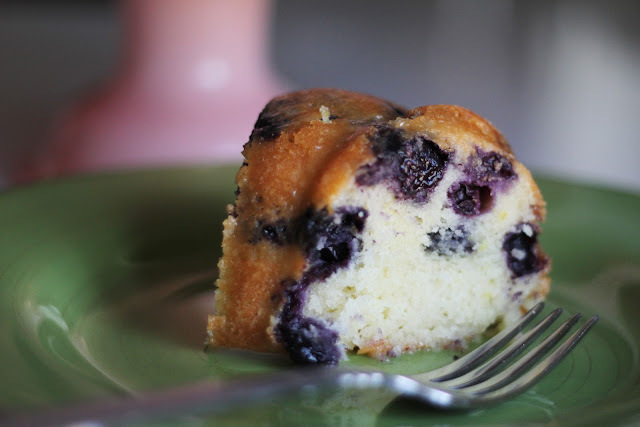 Pour the cake batter into your prepared bundt pan and into the 325 degree oven for 60 minutes. It should be nice and golden. Let the cake cool in the pan for 20 minutes and then turn out on a cooling rack to cool completely. Whisk your remaining 2 tablespoons of fresh lemon juice, milk and powdered sugar together. The glaze should be thin but able to coat the back of a spoon. Drizzle it over the cake. Store covered until ready to serve. Is this our first bunt on the blog? Looks so good! Wish my oven was working, so I could make it. Love ya! 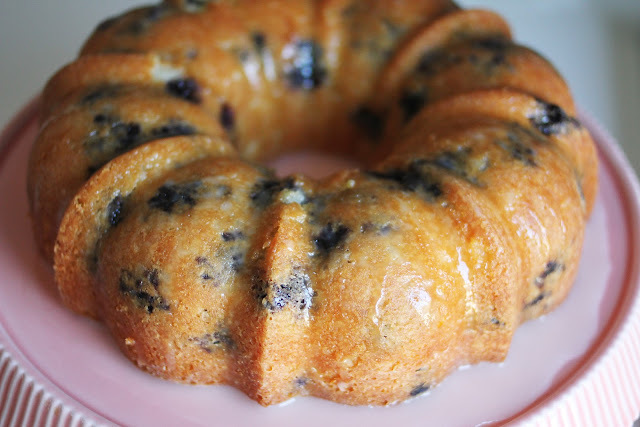 *bundt.....auto correct is crampin' my style. Hahahahaha! Bri, I think you're right! It is our first "bundt"! I'm sorry your oven is still not fixed!:(. This is so good and easy! You'll love it sista! Yum! Looks like I need to pick up some blueberries from costco! This is making my mouth water - it looks so good! I hope it won't change anything too much to use vanilla greek yogurt, because that's what I've got. Mmm, I can't wait! Ash-you won't be sorry! So yummy! Ohhh! I've tried the "a spicy perspective" strawberry lemon version. But this looks just as delicious!! The greek yogurt makes it amazing.